China's Dark Matter Particle Explorer has detected unexpected and mysterious signals in its measurement of high-energy cosmic rays. Chang Jin, chief scientist of DAMPE and vice director of the Purple Mountain Observatory of the Chinese Academy of Sciences (CAS), introduces detection results obtained by DAMPE in Beijing on November 27. China's Dark Matter Particle Explorer (DAMPE) has detected unexpected and mysterious signals in its measurement of high-energy cosmic rays, which might bring scientists a step closer to shedding light on invisible dark matter. The satellite, also called Wukong, or Monkey King, has measured more than 3.5 billion cosmic ray particles with the highest energy up to 100 tera-electron-volts (TeV for short, corresponding to 1 trillion times the energy of visible light), including 20 million electrons and positrons, with unprecedentedly high energy resolution. "DAMPE has opened a new window for observing the high-energy universe, unveiling new physical phenomena beyond our current understanding," said Chang Jin, chief scientist of DAMPE and vice director of the Purple Mountain Observatory of the Chinese Academy of Sciences (CAS). The initial detection results were published in the latest issue of the academic journal, Nature. "This is the first time a space experiment has reported a detailed and precise electron and positron spectrum up to about 5 TeV. In this energy range, we found some unexpected and interesting features. We have detected a spectral break at 0.9 TeV and a possible spike at 1.4 TeV," said Chang. Precise measurement of cosmic rays, especially at the very high energy range, is important for scientists to look for traces of dark matter annihilation or decay, as well as to understand the most energetic astrophysical phenomena in the universe, such as pulsars, active galaxy nuclei and supernova explosions. "Our data may inspire some new ideas in particle physics and astrophysics," said Chang. Dark matter, which cannot be seen or touched, is one of the great mysteries of science. Scientists calculate that normal matter, such as galaxies, stars, trees, rocks and atoms, accounts for only about 5 percent of the universe. However, about 26.8 percent of the universe is dark matter and 68.3 percent dark energy. 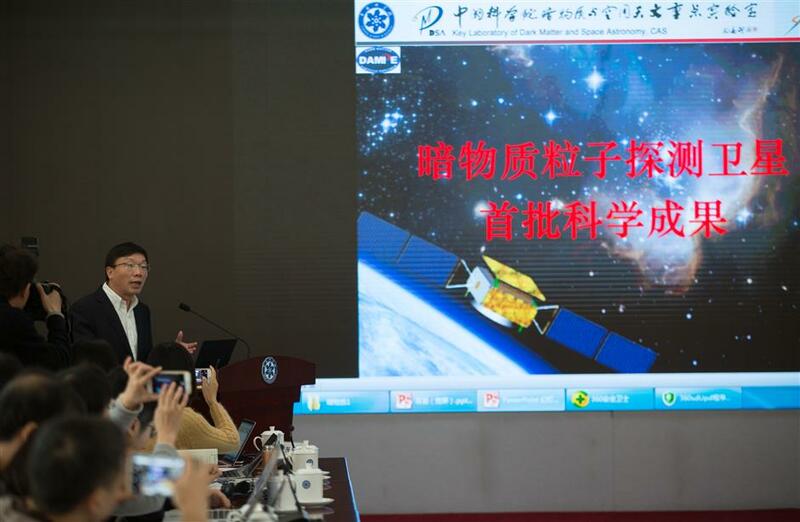 China sent DAMPE into an orbit of about 500 kilometers above the earth on December 17, 2015, to look for evidence of the annihilation or decay of dark matter particles in space. DAMPE has the widest energy range coverage and the highest energy resolution of all the dark matter probes currently in space. Based on the satellite's data, scientists drew the cosmic ray electron and positron spectrum. To their surprise, scientists found a break at around 0.9 TeV and a strange spike at around 1.4 TeV on the spectrum. "We never expected such signals," Chang said. "The spike might indicate that there exists a kind of unknown particle with a mass of about 1.4 TeV," said Chang. "All the 61 elementary particles predicted by the standard model of particle physics have been found. Dark matter particles are beyond the list. So if we find a new elementary particle, it will be a breakthrough in physics," he added. "The spike is very unusual," said Fan Yizhong, deputy chief designer of the scientific application system of DAMPE. "The signals might have originated from either dark matter or pulsars. Even if they were from pulsars, it would be quite a strange astrophysical phenomenon that nobody had known before." "However, the data of the strange signal are still not enough. We need to collect more data to make sure it's real," Chang said. 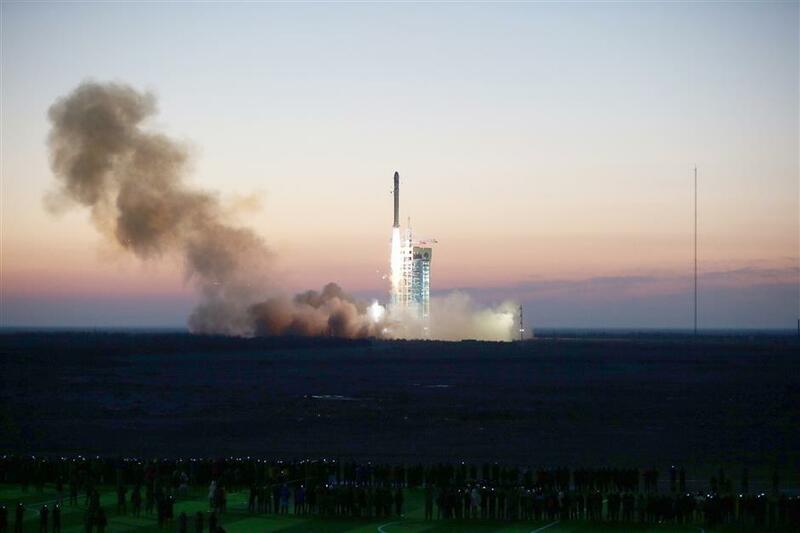 The DAMPE satellite, nicknamed “Wukong” after the Monkey King, blasts off on a Long March 2-D rocket from the Jiuquan Satellite Launch Center in Gansu Province on December 17, 2015. More than 100 Chinese scientists and engineers, together with those from Switzerland and Italy, took part in the development of DAMPE and the analysis of its data. Researchers have ruled out the possibility that the unusual signals are caused by a malfunction of the satellite's detectors. Independent analyses from five different teams all came to the same conclusion, said Chang. DAMPE's design life is three years, but as it is performing so well, scientists expect it to work much longer. "DAMPE will continue to collect data to help us better understand the anomaly and might bring dark matter out of the shadows," said Chang. Nobel Laureate Samuel Chao Chung Ting, leader of the Alpha Magnetic Spectrometer (AMS-02) experiment on the International Space Station, said of DAMPE, "It's a very good experiment." Bi Xiaojun, a particle physicist at the Institute of High Energy Physics of the CAS, said DAMPE's observations are important to help scientists better understand the origin of cosmic rays. "The satellite's data on the spike at 1.4 TeV are still not enough to declare a physical discovery. If the signal can be confirmed with the accumulation of data, it would be of great significance," Bi said. "That could be explained by either dark matter or an astrophysical source. If we use dark matter to explain it, dark matter would be different from what we thought before. It conforms to the popular dark matter model of weakly interacting massive particles (WIMP), but has some special features," Bi said. Chen Hesheng, a CAS academician, said that even if a candidate dark matter particle is found, it still needs other experiments such as underground detection or collider experiments to confirm it, which would be difficult.